Finale M.V.P. Mindy Kaling has grown so much as an actress and as a writer over the course of this season, and “Best Man” was the culmination of that growth. In fact, I can pinpoint the exact moment I knew she was going to be my M.V.P. for this finale. It was moment she devastatingly delivered the perfect response to Danny saying marriage is meaningless: “It means something to me.” The raw vulnerability Kaling projected in that scene in Danny’s old bedroom was stunning. In fact, the entire sequence starting with her subdued, trying-not-to-cry reaction to Danny saying he didn’t want to get married through the conclusion of that bedroom scene gave us her best acting work on the show to date. Chris Messina makes Kaling a better actor, and she’s become such a natural at emotional moments when she shares them with him. There’s something powerful about the bravery of being completely open in your work, and that’s what Kaling did in the episode’s final scenes. Her heartbreakingly real performance made me feel as if I was watching someone I know and love find out their dreams were slipping away. And the honest tone of her writing in those final scenes showed a confidence and comfort with realistic drama that I never would have expected from this show when it first started. The show has come so far since those early days, and so much of that growth comes from its leading lady. What Didn’t Work As soon as “Best Man” ended, I found myself feeling slightly underwhelmed. 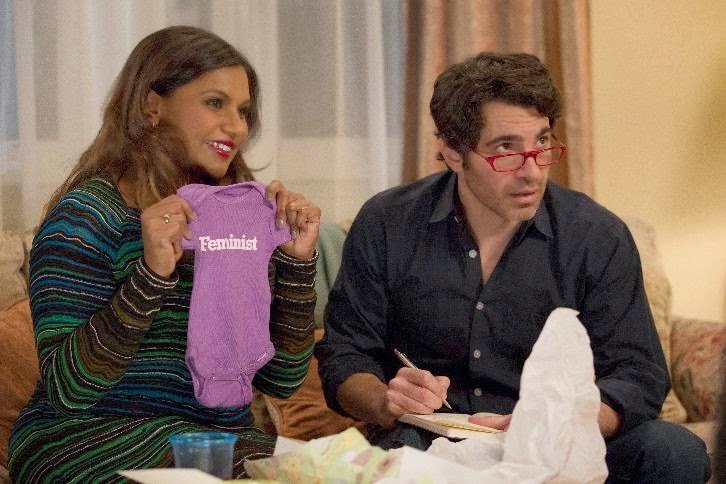 It would be hard for any episode to live up to the perfection of last season’s finale of The Mindy Project (which I thought was the best episode of any TV show in 2014), so maybe my expectations were a bit too high. But I was left wanting more, which isn’t necessarily a bad thing in a season finale, but it could be a bad thing if “Best Man” ends up being a series finale. I actually think “Danny and Mindy” would have made a much more satisfying end to the show. Ultimately, my biggest issue with “Best Man” was its inability to break free of this season’s formula: Danny and/or Mindy does something dumb, Danny and Mindy fight about it, everything is resolved by a nice moment or big gesture at the end. It’s a well-known formula in the romantic comedy genre, but it can start to wear a little thin after 20-something episodes. Danny’s inability to step up and commit to Mindy in a tangible way has been the focus of many of this season’s episodes, and I found myself really frustrated with him in “Best Man” for that exact reason. Watching Danny talk his way out of meeting Mindy’s parents made me feel like he hadn’t grown at all. Danny is a flawed character, and that’s part of what makes him so compelling. However, Mindy has grown so much as a character this season that it almost feels like she’s grown beyond Danny. And maybe that was the whole point of the episode—to get Danny to really start that process of growth by finally talking about his parents’ divorce and his failed marriages. But it still felt like something we’d seen before: Danny gets scared of commitment, Mindy doesn’t back down to make it easier for him, Danny talks to someone who helps him see the light, and then Danny does something big for Mindy to prove he loves her. However, the ending of this episode didn’t actually feel like enough to show me that Danny has really grown. I know, I know—he traveled to India to meet her parents; how is that not enough? Don’t get me wrong; it was a huge step for his character. But I spent the entirety of that final sequence thinking he was going to show up at their door and ask for permission to marry their daughter. And then he just said he loved her. I understand that it was a huge romantic gesture, but it didn’t show me that he’s ready for the kind of commitment Mindy wants, the kind of commitment his mother talked about, and the kind of commitment this whole episode was built around. I know it was a more realistic ending than having Danny suddenly decide he wants to marry Mindy, but that doesn’t mean it was completely satisfying for me. And that could be because I don’t want it to satisfy Mindy; one big gesture shouldn’t sweep serious conflicts of values under the rug. There are still real issues they need to work though, and that’s why I am ready to beg FOX for a renewal for this show. What Worked With all that being said, I still really enjoyed this episode. Even when I was frustrated with Danny, I knew my frustration was coming from the very real emotions this episode stirred up in me. And even before those emotions came to the surface, I thought this was a solidly funny episode of The Mindy Project that had a lot of great details: the marvelous casting of Laura Dern as Mindy’s offensive new OBGYN with a thick Ukrainian accent; the return of many of our favorite men from Mindy’s past (I especially loved Anders Holm basically rapping about impending fatherhood and Max Greenfield talking about horrifying genetic conditions. ); and literally every word that came out of Tamra’s mouth, as well as her perfect gift of a “feminist” onesie for the baby. Ultimately, though, my favorite thing about this episode wasn’t its sense of humor but its sense of heart. It came by every single one of its emotions honestly. Between the Kaling/Messina/Rhea Perlman trifecta and the surprisingly candid writing, I found myself near tears or actually in tears more than once. And we all know my favorite kind of television is the kind that makes me feel. While “Danny and Mindy” was all about the rom-com, “Best Man” was all about the reality of what happens after the rom-com ends. “Opposites attract” works really well in that genre, but can it really work if you and your partner have opposite views on something as important as whether or not you want to get married? That’s what broke my heart the most about Danny and Mindy’s confrontation in his old room: It wasn’t about anyone being the bad guy; it was about two people who love each other but have been shaped by circumstances and personality differences to have completely different ideas of their future. I believed Danny every time he told Mindy he loved her, but I also believed Mindy when she told him that didn’t make it fair that she had to give up her dream of marriage because he’s scared to try it again. What made that confrontation work—aside from the amazing, vulnerable performances given by Kaling and Messina—was the fact that I felt like I understood both sides, and it made me think about my own views on marriage, too. I understood Danny’s very real fear of an institution that’s only ever caused him pain. But I also understood Mindy’s heartbreak in the face of all of her dreams falling apart. I know marriage isn’t a big deal to some people, but to others it is—and that’s okay. Mindy broke my heart when she said it’s not weird for her to want Danny to meet her parents and propose to her someday, because I’m the kind of person who wants that for my own future, too. I related to Mindy so strongly there. She’s demanded some crazy things during the course of the show’s three seasons, but this wasn’t a crazy demand. This was something she’s always wanted for herself, and she still sees it as something meaningful and important. Mindy presumably grew up with parents who stayed married, and that contrasts sharply with the experience of a child of divorce like Danny was. It’s a difference the media doesn’t often address with this kind of honesty, but this episode handled both sides of this discussion with respect and understanding. The fact that I felt more strongly for Mindy is simply a product of the fact that my life experiences and values are more closely aligned with hers. For as powerful as Mindy and Danny’s big scene was, the moment between Danny and Annette was perhaps even more powerful. Perlman has brought such realistic strength and warmth to Annette. From the moment she started talking about how she was wrong to assume that her divorce never screwed up her son, I knew I was going to be a crying mess throughout the whole scene, and I was right. There was such a great mixture of tough love (“You picked the wrong girl to knock up!”) and gentle honesty (“we didn’t pick people who deserved it”) in Annette’s words. It felt like a real mom talking to her son, and that’s the most I can ever ask for. Perlman’s strength allowed Messina to be at his most vulnerable, allowing us to see just how scarred Danny is. When his voice broke while talking about what happened with his own father, I got the best kind of chills. And that hug between mother and son was simply perfect. Despite my feeling that the final moment of the episode didn’t resonate as strongly as I wanted it to, I have to admit that the entire final sequence was set up beautifully. The silent focus on Messina’s face played to one of the show’s biggest strengths—his ability to make you feel without needing to speak a word. It was a smart decision, and it allowed the more dramatic tone of this episode to linger until its final moments. Questions to Discuss All (Spring and) Summer Will Danny’s trip to India be enough to convince Mindy that he’s committed to her? How will they get through this marriage conflict? Who should play Mindy’s parents? And, of course, are we going to get a fourth season, or was this the end? Finale Grade B. It wasn’t the most original episode of The Mindy Project in terms of its plot, but what “Best Man” lacked in creativity, it made up for in raw emotion. It succeeded because its actors were willing to go to intensely vulnerable places, and I can only hope this isn’t the last we see of them as these characters. It had never even occurred to me that Mindy might not be continued – the network would have to be crazy not to keep going, wouldn’t they? I don’t follow ratings or anything but I thought that Mindy has a pretty strong fanbase, she’s all over social media, and it’s one of the best and most diverse shows that Fox has on its schedule. And honestly, even mediocre Mindy is a bunch better than most of the crap comedy that’s on TV these days. I totally agree that the scene with Danny and his Ma was the big, big moment. Those two are amazing actors and they did such a good job showing us just how damaged Danny is from his experience with failed marriages. (I kind of want to point out to him that failed long-term committed relationships with kids involved are just as tumultuous as failed marriages – the piece of paper doesn’t make that much difference. At this point whether he and Mindy marry or not, if their relationship fails in the future it’s going to have just as much potential for awfulness, simply because strong emotions and a child are involved.) But anyway. I get his fear. And you were so right in saying that the awful part of this is that neither one is right or wrong. They just have different views on marriage and there’s not really a place of compromise there. And that’s heartbreaking. They both played that scene so well. I agree that Chris Messina brings out the best in Mindy as an actress. The show is so lucky to have him. And I’m so glad we have gotten so many good Annette scenes this season. I wasn’t necessarily expecting her to be such an important part of the show, but we really need to keep her forever. I enjoyed all the crazy stuff on the side – the best man dance, Laura Dern (as silly as that was), Dot and Annette’s matching vests, Tamra, even the crap with the mis-overheard conversation. Bringing in the old boyfriends was totally worth having that old trope dragged out again. I kept waiting for Mindy’s parents to be shown because I’m so curious who they’re going to cast too. I really want more Mindy in a sari too – just because she looked so beautiful. Watching shows like this struggle with where to go when you need comedy and emotional growth but you want them main characters to be in a steady relationship is really frustrating. As you said, every episode seems to follow the same formula, and mostly it works, but how long can you stick with that before it gets really stale? And if you’re not going to get comedy out of the relationship drama, where is the comedy going to come in? Plenty of shows have main characters in relationships but they’re mostly what I call the “yuck-fest” comedies where every line is played for a joke and most of the humor is very personal and pointed (jokes about personal traits especially). Mindy has a better scenario – it’s more realistic and grown up – but I don’t know whether it has found itself well enough to stick around for too much longer. One more season, please, for definite! But after that, I don’t know… I don’t know if Mindy has enough strong stuff going on with the rest of the cast to allow herself the kind of room to tell more interesting stories in coming seasons. I just don’t know. I really hope she muddles through though. I have a lot more to say than I expected to, too! Sorry, I don’t know if it’s all that coherent. But yeah, this season finale has given us a lot to think about. I enjoyed it and I think Mindy did a great job with it (even if it couldn’t be as awesome as last year’s, but I’m not sure how it could have been, at this point in the story). I sincerely hope that Fox gives Mindy another season to work on this. Even a short season. Maybe these comedies would do better with half-length seasons. I completely agree with everything you said. Even with the ending, I just felt frustrated by Danny. More than anyone else, he knows who Mindy is. He knows that she loves rom-coms and fairy tales and he knew that she was looking to get married. It’s his choice not to want to get married again but that should have been something Mindy knew. That was a terrible way to get blindsided with that fact. This conflict feels so genuine and both have the right to their desires, which is what hurts so much about it. Overall I’ve been thrilled with how this show has handled Mindy and Danny as a couple. There’s been moments that felt repetitive, sure, but overall I think it’s been a really honest, funny, heartfelt exploration of a relationship that’s grown & changed & gotten BETTER as time has gone on. Most shows don’t give the audience credit to think that they will stick with a show beyond the initial build-up – thankfully not this one.